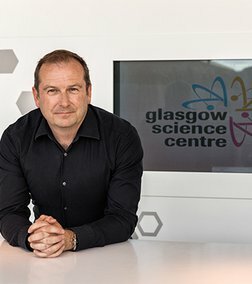 Stephen has been Chief Executive of Glasgow Science Centre for over 6 years – a job he loves passionately. He studied Mechanical Engineering at University of Strathclyde and began his career as an Engineering Consultant before returning to Strathclyde to study for a PhD. He then worked as a Commercial Software Engineer for 6 years before moving into management positions. Stephen has two daughters, aged 10 and 15, lives in the North of Glasgow and is a keen cyclist in the nearby Campsie Hills. I couldn’t ask my colleagues to consider getting involved if I wasn’t prepared to give it a go myself. I lost my father when I was nine and since then I think I have subconsciously sought out male mentors for most of my life. What I was really looking for was somebody who could just tell me every now and again that I was doing ok. I think we all need that positive affirmation and support, especially in the teenage years. On reflection, I think my expectations were a bit unrealistic at the beginning. You’re not going to be able to transform a young person’s life overnight, but you realise that just by being consistent, turning up and listening, you are helping that young person bit by bit to discover their own path. To start with we spent a lot of time talking about football which still forms a lot of our conversations. We both support different Glasgow teams so we enjoy winding each other up on a regular basis. Like me, my mentee lost a parent when he was nine. In many respects he reminds me of what I was like at his age – angry and lacking in confidence. I have seen him calm down and grow in self esteem. The next year will be critical, my goal is to keep him in school beyond Christmas and make sure that he has something positive lined up before he leaves. I have been mentoring my young man now for two years and I have enjoyed seeing him develop and mature over that period. As Chief Executive of Glasgow Science Centre, I spend a lot of time talking about how we ‘inspire the next generation’. Being a mentor keeps it real for me. We all have a responsibility to do what we can to help our young people achieve their full potential. For some people the inspiration is meeting an astronaut, for others it is just being able to rely on somebody turning up to see them on a regular basis to sit and listen to them. Being a mentor inspires me to be a better leader and motivates me to do more, every day to help all of the young people that come through our doors to reach their ability. It also keeps me fully up to date with the Scottish Football scene! I enjoy spending time with my mentee, I enjoy our chats. It keeps me grounded and focused. I think that I am becoming a better and more empathic leader because of it, better able to do my job to the best of my potential. For anyone considering becoming a mentor I would say ‘just do it’. Don’t underestimate the impact you can have through just giving someone your full attention for one hour a week.